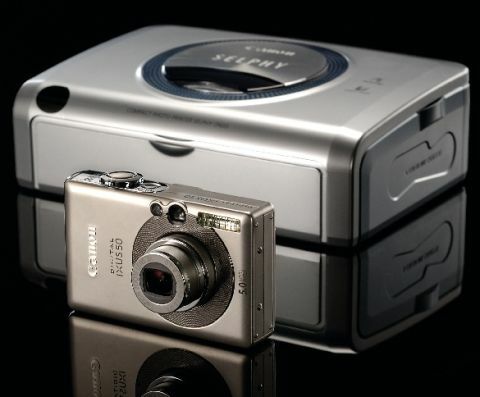 When Canon launched its IXUS camera brand as an APS film model, way back in the early 1990s, it was the last word in style and high-quality construction. Since those days, Canon has released a slew of IXUS products, but not all of them have been as reliable or well built as the early models. Well, it seems that Canon is now back on form with the release of the IXUS 50. This utterly delectable, tiny 5-megapixel compact camera both looks and feels solid and stylish. Pick it up and you immediately fall in love with its ultra-compact form, which is smaller than a deck of cards and the build quality is superb. And yet despite its diminutive dimensions, the IXUS 50 still manages to pack in a bright 2-inch LCD and a 3x optical zoom. It is simply the most exquisite compact camera and feels so good with its all-metal body and slim good looks. Image quality is very satisfying for a camera of this size. At a pinch the photos will enlarge to A3, although there is no option to shoot in RAW mode or TIFF. Images are stored on a Secure Digital card, although you do only get a measly 16MB card in the box. As a point and shoot camera that can go anywhere, this is the business. Because the IXUS 50 is PictBridge compliant, you can hook it up to Canon's SELPHY CP600 personal printer for outputting instant prints at a party or family gathering. Using dye-sublimation technology, the SELPHY CP600 outputs continuous tone postcard-sized prints and the cost per photo is fixed. You buy a cartridge and 36 sheets of paper in one handy pack and the cost comes out at around 23p per print. The quality is good and the prints that come direct from the camera look great. The dye-sublimation technique of printing means that the photos should resist fading for as long as a conventional silver halide print. The thrill of being able to give away a print to your granny while at her birthday party is worth the expense and the slightly blue cast that the dyesub system seems to produce. The SELPHY 600 is available with a rechargeable battery, so you can hook it up to the IXUS 50 and print of photos in the middle of a field, if indeed that is your wish.